We are a city dominated by female bakers and therea��s no debating that. a�?It has to do with exposure in the kitchen,a�? feels KP Balakumar, founder of the Home Bakers Guild. a�?We grow up with not many people baking at home,a�? 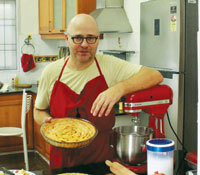 he adds, pointing out that in the six bakers showcases he has organised, there has not been a single male participant. But on a professional level, the male bakers outnumber the female, feels Nicky Mahboobani of Nickya��s Cafe. a�?Men enjoy it because it involves science, knowledge of flour, physical effort like lifting heavy trays, kneading, etc,a�? he makes a case. Being a Belgian-Canadian born in France, wea��re not surprised when Christophe Bonello tells us that everyone in his family cooks. a�?But I started only after moving to Canada,a�? says the PhD holder in Computer Science. Canada also happens to be the place where Bonello met his wife, who works at the Belgian Consulate. Baking for around 15 years now, Bonello has a long list of specials ranging from muffins and cakes to lemon tarts and pies. But his best creation he admits, is the apple pie that his friends back in Canada swear by. Closer home, Bonello lists his wife as his greatest critique, and says that ita��s not too hard to find good ingredients in Chennai. a�?You can get most of the ingredients easily. Especially at Wall Tax Road,a�? says Bonello, 49, who has attended a couple of cooking classes at Park Hyatt and is currently busy with an upcoming project. a�?I am spending a lot of time working on Belgian waffles now,a�? he reveals, hinting at a restaurant launch of sorts, early next month. A marineengineer turned content writer, Rohan Sylvester says that it was his love for thin crust pizza that drew him to the kitchen. a�?I just had to learn to make thin crust pizzas. One thing led to another and I ended up learning to bake and cook,a�? Sylvester confesses, admitting a fondness to savoury baking. And while his sister Marsha Thompson is a popular home baker in the city, Sylvester says that his baking lessons were courtesy YouTube channels and books. a�?The videos on Food Vicious are great to learn technique. And they add a good bit of humour too,a�? he says about the YouTube channel. A firm believer that ita��s all about the right measurements, Sylvester, 29, feels that most men are intimidated by lengthy procedures and fancy names of techniques. a�?But they are actually simple and can be done step-by-step over days,a�? he offers. And while he feels that no one subscribes to notions like a�?thata��s femininea�? in this day and age, he has somehow never got down to making a batch of cupcakes. a�?If I want good cake, I just go to my sister,a�? he laughs. faculty for baking at Sishya. Ita��s about six years since his first lesson, but he recalls, a�?To get the batter right was the first thing she taught me.a�? Even with an experienced teacher, Shroff managed to burn his first cake. a�?You learn slowly,a�? he smiles, in defence. 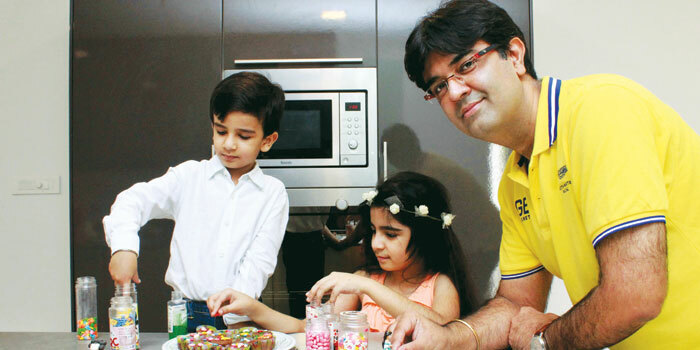 That said, Shroff, 35, who has been in the chemicals industry since 1997, enjoys baking with his kids and wife and makes regular stops at the Currimbhoys baking section hunting for varieties of ready made fondant. And though his wife prefers to works alone, as a family, they make a lot of mini cupcakes and sponge cakes with icing. 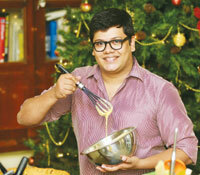 Fairly new to baking, Suneel Shankar started two years ago. When his elder daughter was a�?old enough to help in the kitchen,a�? to be precise. This father of two always had the basic kitchen skills since he studied abroad and had to cook for himself, but picked up baking from shows by the likes of Nigella Lawson, so he could bake for his children. Working as a team head at a leading BPO, Shankar enjoys flexible timings, but prefers to bake in the morning or over the weekend so his kids can join in. Needless to say, his daughters (six and four) are his fans, and they enjoy assisting him with tasks like blending, peeling, breaking eggs and mixing them into the flour. Luckily for Shankar, his wife does not mind this as long as he cleans after them. a�?She actually enjoys that the kids are involved. And I find baking therapeutic,a�? says the fan of breads, whose toughest bake till date was the orange zest and almond cake he recently tried. Shankar, 39, incidentally grew up with KP Balakumar who has been baking even before he started the Home Bakers Guild, and though the friends have never baked together, they now exchange notes. A native of Tirupur, Dineshkumar Nataraj used to take orders from a select group of friends and neighbours who loved his biryanis and vatha kozhambu. Nataraj, who started cooking as a boy, currently works as a technical writer in Chennai, and tries a lot of Continental recipes (he swears by TLC). As for baking, he has always wanted to learn, but recalls being turned away at every baking class he approached in Coimbatore. a�?Even in Chennai, save for a few, not too many people are open to teaching men,a�? insists Nataraj, 28, who is self taught and is currently honing his oven skills under the guidance of expert home baker Sara Koshy. Apple strudel pies, mince pies, tuna loaves, casseroles and Christmas cakes are some of the bakes he is good at. And the fan of fusion fare does a good deal of experimentation too. At a recent beach cookout with the Chennai Food Guide, his chicken marinated with rasam powder was doing the rounds, we learn. a�?I have done a cheesecake with a motichur ladoo base and gulab jamun inside and a pudding made of sugarcane and rice flour with a ginger and turmeric sauce,a�? Nataraj shares a couple of his sweet experiments. a�?I hope to start my own studio kitchen soon and yes, it will definitely be open to gents too,a�? he concludes.